Club Penguin Cheats by Mimo777 Club Penguin Cheats by Mimo777: Club Penguin Anniversary Party and Storm MISSION News! Club Penguin Anniversary Party and Storm MISSION News! Check it out! 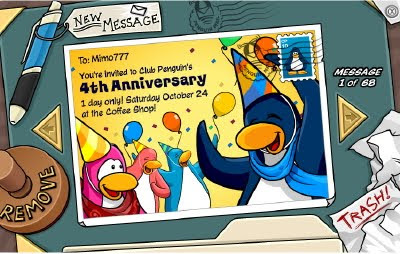 Club Penguin has sent us postcards to remind us about the 4th Anniversary Party that will be here on Saturday! Also, the storm that is caused by the Volcano, will be here on October 27th. Just when the Halloween Party starts. Gary the Gadget Guy says this storm is going to be a "doozy." He is "concerned" that this storm might not just roll in and out and that he may need to talk to other scientists to see about what to do if the storm settles down on its own! Dude, does that sound like a mission to you? It sure does to me! We are so in need of a new mission. I sure hope Club Penguin is not trying to mess with us again! What do you think? Possible mission? hope it is a new mission. OH MY GOSH I JUST NOTICED AND SAW THAT THEY PUT MY COMIC IN THE FREAKIN NEWS PAPER!!!!!!! get angry if i'm wrong! woah awesome dude i once had a joke in there. Awsome, I hope it is a new mission, I am getting bored with the missions. hat is one of the coolest things ever. omg cool another storm this will be better this time cause im a member and i hope theres a new mission. JUst to say on chobots the robots are coming soon. Do all of you still get on Chobots world? Wii do you still play Cp i havent seen you on. Why would cp do that lol! It's probably a new mission! It would be awesome if we got a new mission! I also can't wait for this party coming up. Hopefully but i dought it. Ya we are in SUCH need of a new one and good thinking i wouldn't of ever thought of that. Haha. Obiwanjoe here. Sure does to me too. so... i live in the phillipines. Only way i can talk to u. and meyby wen the strom comes we'll really have a testing mission where we need to bild a mill. just kidding. not a mill. a device that will make the storm go away. This is so cool! Ug, the 27th seems so far away! nice guess! you know i think that may be right! Wow congratulations! But next time try not to use all caps. Hey mimo I just realized something! Last time we had a storm on CP Sensei came and the Card Jitsu came! Plus ninjas came! Maybe something else will come this time! Thanks! Personally, I think CP is taking a break from missions. I think now they are doing ninja things. If I'm not mistaking, there hasn't been a mission this whole year. It probably won't be because the missions are about Herbert the Polar Bear and capturing him. It would be cool if there was a new mission because we are in MAJOR need for a new mission.... I want a new mission!!!!!!!!!!!! IMHO (in my humble opinion) i think its herbert. if this isnt a mission i am going to quit club penguin forever!!! actually probley not but ill be super mad the missions are like my faverite part of clube penguin!! hey mimo way in the back of the postcard there is a blue penguin with a green and blue hat on maybe thts the new party hat?? Well, ya never know! Maybe CP decided that we need a change! Herbert the Polar Bear has gotten pretty old, don't you agree? gary the gadget guy has spoken to much! THIS MEANS MISSION! lol the sayings war but i said mission. WELL If he soo concerned we should be concerned about a mission! i agree with u mimo! That's a good guess! I love those colors together! Don't worry, we won't get angry if you're wrong. It's a nice color combination, so you never know! Awwww! That stinks! This will be my first anniversary party, so I'm all jazzed. I'm sure Mimo will tell you all about it... but it won't be the same. We'll miss ya! Hmm, it does sound like a new mission, but last year they also had the storm. If it is a new mission i can't wait to play it. Can't wait till the Halloween Party & the 4th Anniversary. It's good that your trying to guess the colour of the hat. Personally i think its going to be green, orange and yellow, but we dont know. We'll find out on Saturday. I also have to agree on it being awesome on how the storm is coming this year, last year it came over the Cove, but this year its using a volcano. That just makes it more likely that they'll have a new mission! CP knows that everybody wants a new mission, and CP usually takes our ideas into consideration! I still think their trying to just get exited over nothing :P If by scientists they mean agents YAY!!!!! The colors for the party hats i think are blue green and yello. MISSION MISSION MISSION MISSION !!!!! Herbert the polar bear did it! i hape we unlock new land. we have been waiting too long. the last land we got was the cove, and i guess you could say the dojo courtyard and ninja hq. Happy Halloween from Mimo and Club Penguin Gang! Freaky Club Penguin Ghost Screen Glitch! Webosaurs Halloween Party RIGHT NOW! More News On Club Penguin Ninja Storm Mission! Club Penguin Halloween Igloo Decorating Winners! Mimo's Club Penguin Halloween Party Quiz! Club Penguin Halloween Party is Here! All 5 Club Penguin Party Hats! Here They Are! Club Penguin's Rockhopper Plants Grow Again! Tomorrow is Club Penguin's 4th Anniversary! New Club Penguin Pin Cheat - 4TH ANNIVERSARY PIN! Club Penguin "Reviewed by You!" Club Penguin Happy77 Talks To A Party Planner! New Treasure Book Series 5! Club Penguin Anniversary Party This Saturday! You can Now Save your Club Penguin Igloo! Igloo Decorating Contest Now Open! 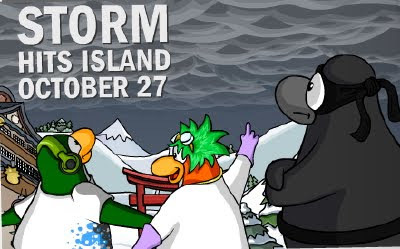 Storm Coming To Club Penguin and Igloo Contest! Grey, Club Penguin's New Color... NOT! Club Penguin New Furniture Coming Soon! Sweet Club Penguin Glitch at the Dock! Mimo's Scarey Tootsville Party Was Scarey! LOL! New Club Penguin Pin Cheat - FOOTBALL PIN! Mimo is Having a Rockin Party on Webosaurs! Club Penguin Happy77's Monster Talk! Club Penguin Sneak Peek and TWO Parties! Waves, Waves, Waves on Club Penguin! Action at the Club Penguin Volcano! Gnomes in Club Penguin Books & Posters! Club Penguin Reviewed By You and Winning Gnome?! Club Penguin's Sensei and Halloween News!